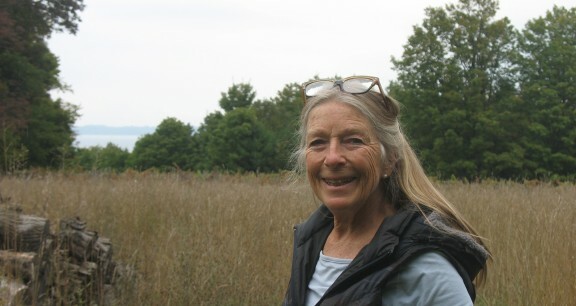 Long before the local foods movement swept the nation and the words sustainable agriculture infiltrated our vocabulary, Jayne Leatherman Walker was devoting her life to these causes. Now, as she looks toward the close of her time on Earth, Jayne wants to make sure that her legacy furthers the movement. 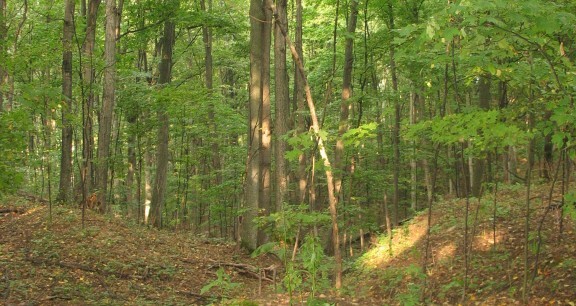 To that end, Jayne has donated a conservation easement* on 40 acres in Bingham Township that is surrounded by development. Her dream is that the Eco Learning Center she established here in 1999 will continue. And that her land will welcome 30 families to tend garden plots here, feeding them physically as well as spiritually. Her passion has revolved around restoring fertility depleted by years of monoculture farming. A stage 4 lung cancer diagnosis last February has made her even more acutely aware of that network—and of the preciousness of place. It has also fueled her desire to make a difference. You’d never know she is battling this disease; with her long blonde hair and trim figure, she looks far younger than her 70 years, and has an energy level to match. On an overcast afternoon, she offers an enthusiastic hug and celebrates the view with a sweep of her arm. The land, along Bingham Road, just off M-22 has a commanding vantage point of Power Island and Grand Traverse Bay from its ridgeline. “It would be an ideal condo site,” says Jayne, who bought the land after moving to the area from San Diego in 1983 with her ex husband. 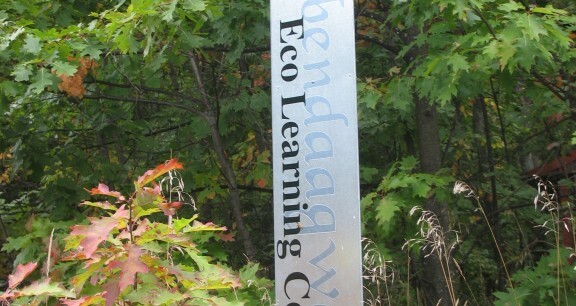 With the help of a small inheritance, she began the Eco Learning Center. At one time she had three summer interns, a couple of employees and CSA (community supported agriculture) that fed 20 families. Living on the West Coast for years introduced her to sustainable agriculture practices. 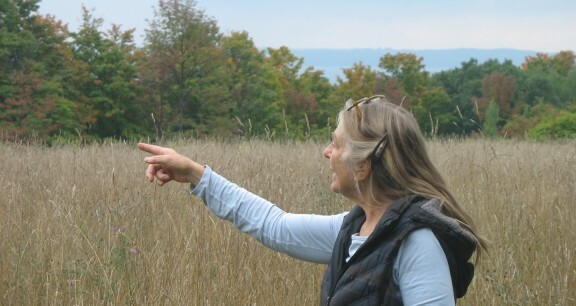 Over the years she has been an avid student of such things as soil microbes and beneficial insects, and how to farm so that wildlife corridors are respected. “I’ve always grown things and am a big picture thinker,” she says. Indeed. Walking the upland reveals old greenhouses, a chicken coop and a solar shower. There is even a metal sculpture fashioned from old stainless steel sinks and other found objects—the byproduct of a woman’s welding class. Months of cancer treatment has forced Jayne to abandon farming and halt the activities of the Eco Learning Center. But these once-busy remnants of her vision rise from the tall grass and weeds, whispering of possibilities. Had she sold the land and split the proceeds between her heirs, it wouldn’t reflect what she really wants to pass on to them. “What better modeling can I do than to show them how important place is?” she asks. 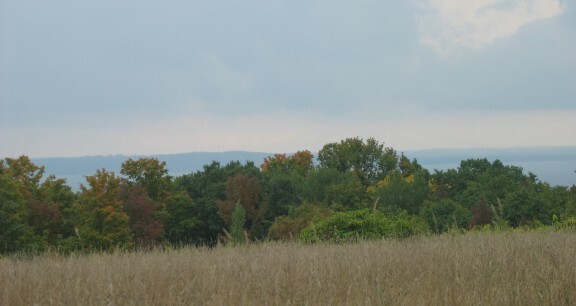 For whoever stewards this land after Jayne, the conservation easement will allow for 51% of the 40 acres to be farmed and for structures to be maintained. It also allows for one home site. “I would love to see someone build a furnace-less house, built into a berm and use solar and wind energy and green building materials,” she muses.